There was no way we were going to see the eclipse of the sun from Sydney. The sky was coolly blanketed and a gentle mist rain fell. However, I knew the time the eclipse was due to occur, so a bit before 8am, I lit a stick of incense and spent some time setting my intentions. The very fact that the eclipse was hidden from sight, but still happening seemed significant. It made it easier to focus on the energy of the moment, instead of being swept up in the excitement of finding old X-rays to peer through and lining up the family to have a look. For me, 22 Scorpio, where the eclipse occurred, is in my 2nd House (If you want to learn more, visit astro.com), thus my intentions revolved around material circumstances and my relationship with my body. I am slowly learning more about astrology, thanks to Kim Falconer. As it turned out, the eclipse wasn’t the only interesting event of the day. Mid-morning I set out for my walk around the Alfred Whaling Reserve across the road. As I walked, I noticed a bird floundering under the trees. It was a Magpie that had been hit by a car and was clearly severely injured. I picked it up gently and decided to walk towards the veterinary clinic down the way and see if it survived that distance. Sadly, it died as I cradled it against my chest. I returned to where I had found it and buried it at the foot of one of the trees. I continued my walk, blessing the spirit of the Magpie as I went. I usually walk round the reserve twice, and as I was again nearing the place where I had buried the Magpie on my first trip round, I spotted a fledgling sitting on the path, just a couple of feet away from the busy road. Concerned for its safety, I approached it from the road side so that if it tried to escape me, it would move away from danger to the safety of the park. It didn’t budge – just gazed up at me with a beady Noisy Miner eye. (Please note – Noisy Miners should not be confused with Indian Minahs. They are indigenous to Australia and deserve our care no matter how much they shout at us and our dogs and cats.) I scooped the little fellow up to move it to safety. It promptly let out a shriek for help as only a Noisy Miner can! I moved a few steps away from the side-walk and opened my hands to let it flutter free just as the rescue party arrived. As I protected my head, laughing at their scolding fury, I counted how many birds had come to the rescue of this one little youngster – no less than eight! What a wonderful community response. How can one not respect our feathered brethren when they show such solidarity? Later in the day I had time to pause and consider the events of the morning. I wanted to discern the meaning in these things – figure out what it had to say to me. 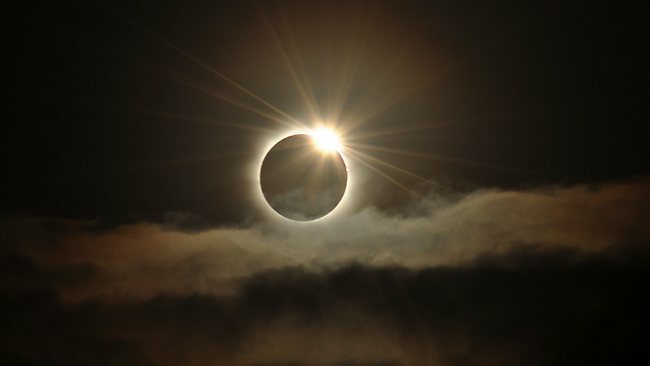 In the first place an eclipse can symbolise death and rebirth. It’s a strong image, an image of transformation, in the same way that we use the metaphor of metamorphosis. That was exactly what I needed, as I focussed my intentions on changes in the way I see and relate to my body and money. The two birds seemed to emphasise this message, one with a life ending, and ceasing to fly in the spirit realm, the other at the beginning of it’s life, just learning to fly. The Magpie, being a corvid, is easily associated with many sorts of transformations, shape-shifting and walking between worlds. As I carried it back to the tree for burial, I was aware of feeling that it left me somehow connected to the Magpie spirit – anchored, perhaps. Thus the time comes for me to focus outwardly on new things represented by the chattering communal nature of the Noisy Miners. There are three primary areas of transformation I am focussing on: spiritually, my path has been about slowly moving from a Christian context to one of pagan druidry. It takes time to learn the vocabulary to speak one’s new spirituality when one has been used to a particular “language”‘ for so long. Physically, I want to translate my mental image of myself, as thin and strong, into reality – to be healthy and kind to my body. In a wider context and looking specifically at money, I want to move from my “love of money is evil” Christian past to a more sensible way of realising that I have the ability and opportunity to look after my family well and to make that happen. The first of the three – the spiritual transformation is already well under way – represented by the Magpie. The latter two are my current area of focus – represented by the fledgling Miner. This brings me to my final realisation of the day. I have been struggling for some time to work out what magic is, to me, in a useful way that I can share. I don’t do spells, I only set intentions. I am dubious about suggesting that much magic resides in “things” as I believe far more resides in us, yet I am not above using things as magical from time to time. I have felt that my idea of magic differs from what others might think magic is, though I dare say I’m not alone in my interpretation. Sometimes a coincidence is just a coincidence, and sometimes it’s an omen. Sometimes we miss seeing omens that are clear and obvious, and sometimes when we pay attention to coincidences the meaning we bring transforms them into omens. Omens can be used as tools to bring transformative understanding and insight. To me, this is what magic is all about. Today I felt as if something important came together for me. I have indeed worked with the eclipse and worked with the birds that entered my life. They have formed deeply meaningful symbols for me, and that meaning-making serves to amplify my intentions for change in my life. The transformation potential is invoked. This is what my idea of being a druid is all about, and this is the gift of this day – perhaps a gift bestowed in parting by a Magpie leaving for the Summerlands. It feels like an assurance that I am truly learning to walk the druid path and work druid magic, with clear understanding of what it is that I do. ~ by Dragonwyst on November 14, 2012.